Holy Potatoes! A Spy Story?! is a the latest in the Holy Potatoes! series by Daylight Studios. It’s been on other platforms for a little while now, but is finally making its way over to iOS this week on March 28th. It’s a silly game where you manage a spy agency full of talking spuds. Your first mission is to help out a kid who was bullied by another student who posted a photo of him on Tastebook to poke fun at him. There’s puns galore, the agents you hire have names like Pactato (who looks like Pac-Man) and the missions you take on are quite ridiculous. I’ve only played about an hour so far, but I’m enjoying the humor. The gameplay mostly involves building up your headquarters with things like a toy factory, decryption lab, and cheesy novels. 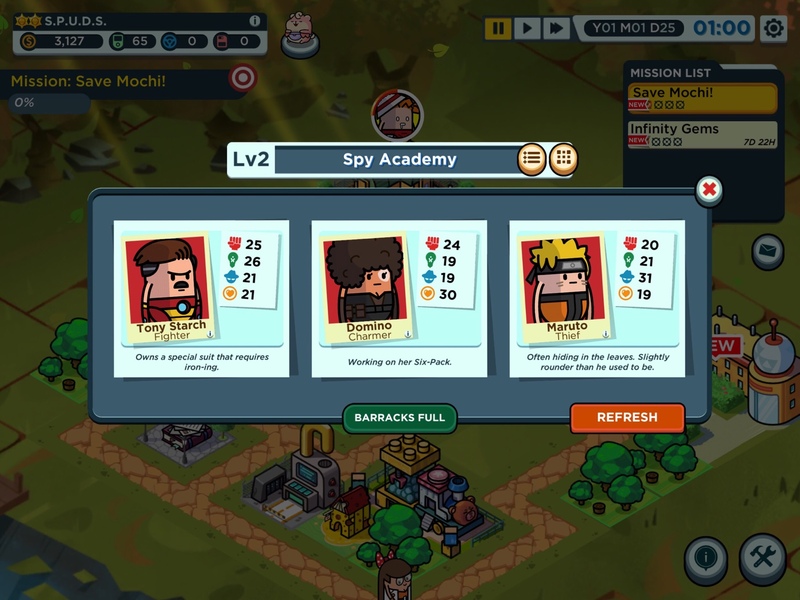 For missions, you choose which spy to send to infiltrate enemy headquarters and then which skills they should use against each guard. The best part is that it’s a completely premium game with zero ads or mictrotransactions. You can pre-order Holy Potatoes! A Spy Story?! right now for $4.99, or you can try your luck and enter my giveaway for a chance to win one of three codes to download it for free! I have three (3) iOS codes of Holy Potatoes! A Spy Story?! to give to three lucky readers. Please read the instructions below carefully to ensure your entry is accepted. 1. Make sure you’re following @AppUnwrapper and @DaylightGames on Twitter. You can also “Like” my Facebook page for an extra entry. You can also share this page via Facebook for a second entry. 3. To make sure you’re entered, comment below with your Twitter/Facebook username and any methods you used to share, so I know you’re interested in a promo code. Winners will be contacted through Twitter, Facebook or e-mail. The contest will end Wednesday, March 27, 2019 at 12 PM EST and there will be a drawing for three (3) iOS winners. Codes will be given out to winners as soon as the game is available on iOS. Please make sure to use the code ASAP, as it does expire. To use the code, go to the “Games” tab in the App Store, scroll down to the bottom, and press “Redeem.” Log in to your account and then paste the code in the text box. Then download and enjoy! I already follow you on all platforms. I am now following DaylightGames. I tweeted and posted the message on Twitter and Facebook. Shared the giveaway info both on Facebook (Slava Kozyrev) and Twitter (@SKozyrev83). Thanks for the giveaway!